Our 2018 GARLIC harvest is under way at Heritage Island Farm on St Joseph Island. 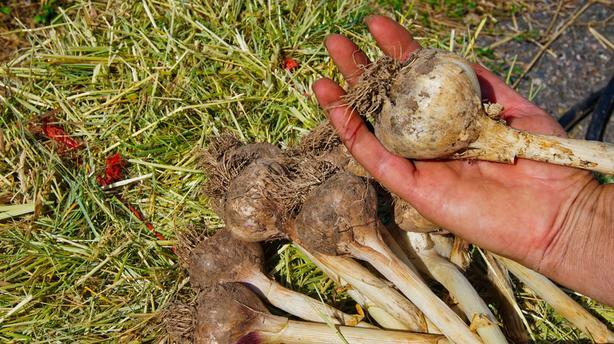 We are offering garlic for PLANTING as it is available - we have 10 different varieties this season, and planting garlic in all varieties will be available, in limited quantities. All grown here, on our farm on St Joseph Island, all winter hardy here. First variety available NOW is "Big White"- this is the garlic in the photo. This is a mild garlic, ideal for the garlic fan that does not want the heat but loves the taste. This is our mildest variety. Sold by the bulb for planting. Contact us to order your planting garlic...we can ship by Canada Post.